Blue Jeans Cable announces the introduction of our new Series-3A active HDMI cable, for use in longer runs up to 18 Gbps (the HDMI 2.0 limit). More details here. Here's something you won't find anywhere else: Ethernet patch cords for Cat 5e, 6 and 6a, with individual certification testing and a full-color test report printout on every cable. The great majority of Cat 6 and 6a Ethernet patch cords sold both in stores and online are non-compliant--our tests (see our article: Is Your Cat 6 a Dog?) show that very few of the cables which are sold and labeled as "Cat 6" comply with the specification, and many "Cat 6" cables don't even pass Cat 5e! We assemble our Ethernet patch cords in the USA using American-manufactured connectors and (in the case of 6 and 6a cables) American-manufactured, Belden bonded-pair cable stock, and we test every last assembly on a Fluke certification tester, so that you can be assured of really getting the performance that you've paid for. Blue Jeans Cable is proud to offer a product available nowhere else: speaker cable with ultrasonically-welded terminations, for the highest pull strength and best electrical connection integrity available in any speaker cable, anywhere. Our West Chester, PA-built Sonobond Ultrasonic Welder allows us to fuse the copper speaker wire directly to the brass banana plug without the use of compression screws, setscrews, or solder--to read more about this new process, see our article: Ultrasonically-Welded Speaker Cable at BJC. 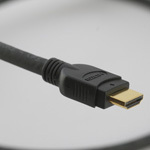 As a general rule, HDMI cables are nearly identical to one another in their internal structure. Blue Jeans Cable offers the only cables on the market with a fundamental structural difference: the BJC Series-1 and Series-FE Bonded-Pair HDMI cables. Unlike other "American" brands which are simply Chinese cable stocks rebranded with an American name, these HDMI cables are built from American-made custom cable stocks, unique to Blue Jeans Cable, and incorporating Belden's patented bonded-pair technology, which stabilizes pair spacing for tighter impedance control, lower return loss, better high-frequency performance and, ultimately, better reliability over distance. That reliability is attested both by our longer-than-the-competition HDMI testing certifications and by in-use experience; we have run 1080p video in the Series-1 cable 125 feet without information loss, with no booster or EQ unit required. Our online checkout will now support various shipping options in addition to our standard US Priority Mail shipping, including (for domestic customers) FedEx Ground, Second Day Air and Overnight. International customers can select, depending upon the country to which the order will ship, between methods including standard postal services (with duties and taxes paid by the customer on receipt) and a duties-and-taxes prepaid FedEx International Priority service.